Could a Windows Mobile phone actually challenge the iPhone? 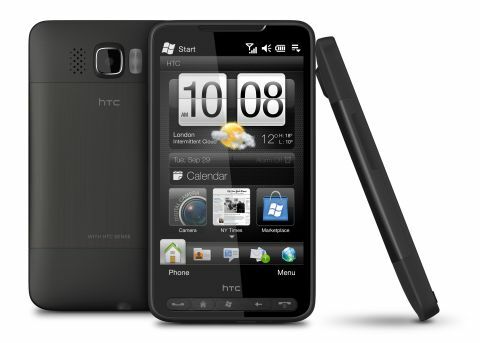 A brilliant effort from HTC that almost completely hides the fact it's based on Windows Mobile. However, at 4.3 inches the screen is likely to put off a lot of users. The HTC HD2 is the world's first Windows Mobile-toting phone with a capacitive screen, and also packs the world's largest mobile phone display too. It's also the first WinMo phone to use HTC's Sense UI, previously used on the company's Android handsets, bringing with it Facebook integration and direct Twitter access, as well as masking well the operating system beneath it. Running Windows Mobile 6.5, it certainly makes use of the all the good bits of the upgrade, but HTC decides to do its own thing on around 95 per cent of the HD2. The first thing that most people will notice when picking up the HTC HD2 is the sheer size of the screen, which is justified when you realise it's a whopping 4.3-incher. The screen dominates the whole front of the phone, reaching very close to the edges on either side and only leaving room for a speaker at the top and buttons at the bottom, meaning it's a very nice tablet-style look. The buttons on the front of the HD2 look like brushed metal, and are nicely rounded and raised, making them easy to hit. There's the usual suspects on offer, with the call and terminate keys flanking the home, back and Windows buttons. Other than that, there's very little else on the HD2 button-wise. On the left-hand side, around half way up, there's a volume up/down key, which is flush to the chassis. This is actually a little hard to hit at times, as it's difficult to find it when not looking. The bottom of the phone houses the microUSB slot for charging and PC connection, along with the 3.5mm headphone jack. It's an odd place to put this pair, with the common option being at the top or in the top corners, and it means a headphone jack can sometimes get caught up in the pocket. It's also hard to text in portrait mode when listening to music – we know that sounds like a pretty niche situation, but as the multimedia aspects of the HD2 have also been upgraded, this is important. The rear of the phone is also pretty minimal as well – apart from the camera (with dual LED flash) there's very little else to look at. It takes a while to work out how to get the battery cover off as well, with a slight groove on the right-hand side needing to be pulled pretty hard to remove it. The battery looks pretty small, although that's probably just to do with the scale of the HD2. It basically holds in the SIM card and nothing much else, with the microSD card slot sitting away from it, making hot swapping possible. The other noteworthy aspect when picking it up for the first time is the weight of the phone - it's just 157g with battery, which is pretty darn light for a phone this size. The camera protrudes slightly at the back, which can get in the way of holding it, but this is a minimal problem as you swiftly learn to shift it to a more comfortable position. The phone is curved nicely on the back, meaning it sits well in the palm. And despite the huge screen size, it's actually not that hard for the average (admittedly male) palm to navigate to all the important areas of the screen, with the thumb easily called into action to hit the upper levels. Keeping with HTC tradition, the box is a slim design featuring just the basic components. This means a microUSB lead, an adaptor to let you plug said lead into the wall, a pair of headphones that double as a (pretty cool with remote control for the music player) hands-free kit, and of course the phone itself. We're not too sure we like the fact we only get one USB lead that doubles as both the charger and the computer connector, but with the polar bears in trouble the way they are, it's only fair we all do our bit. However, we do like the lack of CD in the box for software, with that being either available on the phone or downloadable from the HTC website.